Taking full advantage of last season’s museum and gallery offerings required time, stamina, and frequent flyer miles; but if you were willing to make the effort, it was possible to see a pair of reunited eighteenth-century panels in Toledo, Ohio; test your powers of discernment against some visiting Caravaggios in Boston; and examine the unlikely friendship between two nineteenth-century modernists in Washington, DC. Sculpture lovers could revel in two informative surveys of modernist sculpture, both on the Upper East Side of Manhattan. And for those whose accumulated miles stretched to Paris, there was an ambitious installation by Ilya and Emilia Kabakov at the Grand Palais; a sculpture commemorating the Compagnons de la Libération at the Assemblée Nationale, plus other installations, outside of Paris, by the author of that new monument; and, in the Marais, recent paintings by a British-born painter of elliptical narratives. And that was just the tip of the proverbial iceberg. The permanent collection of the Toledo Museum of Art is reason enough to visit this unexpected treasure-house—everything from a pavilion devoted to glass to intimate Chardins, dazzling monumental seventeenth-century works—the Guercino is a marvel—a knockout Courbet, and some terrific Frank Stellas. 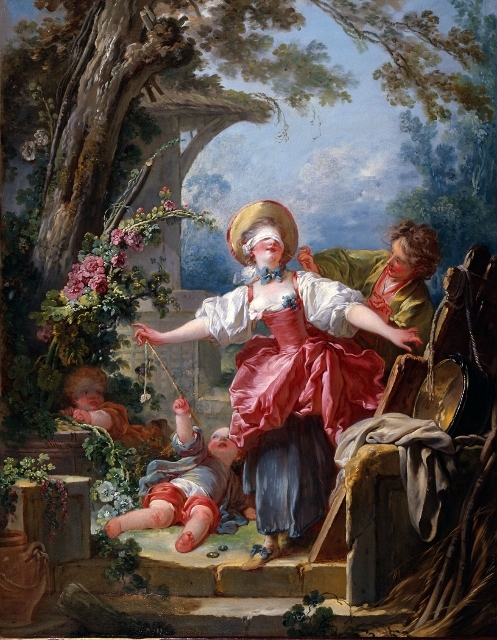 Last spring, these spectacular holdings were enhanced by “Love and Play: A Pair of Paintings by Fragonard,” a small, enlightening show uniting Toledo’s own charming Blind-Man’s Buff, painted by the Rococo master in 1750–55, with its pendant, The See-Saw, Thyssen-Bornemisza Museum, Madrid. 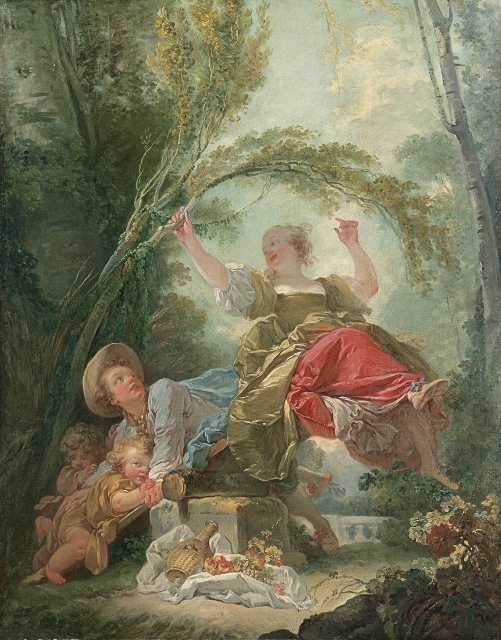 Since the two were last seen side by side, as the artist intended, in Paris in 1987– 88, the reunion was notable, especially because together these paintings tell us almost everything we need to know about both the ancien régime and Fragonard’s style. We were presented with his “signature” world of endless springtime and endless leisure, a flower-filled, well-groomed Arcadia in which pretty, beautifully dressed young people play frivolous games that stand for flirtation and amorous trysts. The conceit was familiar, but there was a noteworthy twist in the works brought together in Toledo. The protagonists of Blind-Man’s Buff and The See-Saw appeared barely emerged from childhood, which added some titillating ambiguity, a kind of false innocence, to the proceedings. Yet, the games themselves became metaphors for the unpredictable qualities of love. Add Fragonard’s virtuoso brushwork, delectable colors, and ability to suggest everything from silk to shrubbery with rapid touches of paint, and the aesthetic of pre-Revolutionary France was largely accounted for. Any gaps in that history were filled by some related prints and sculpture, an elaborate clock, and a magnificent ormolu-trimmed commode, all from the same period as the two paintings. Vive la France! At the Museum of Fine Arts, Boston, “Visiting Masterpieces: Caravaggio and Connoisseurship,” organized with the Muscarelle Museum, Williamsburg, Virginia, four largely unfamiliar paintings from Italy provided an eye-testing capsule tutorial on Michelangelo Merisi (1571–1610), known as Caravaggio after his probable hometown. Two of the exhibited works, bracketing this astonishing painter’s brief career, are unquestionably accepted as Caravaggios. The Fortune Teller, c. 1594–95, Capitoline Museum, Rome, with its sly but charming girl and her fashionably dressed, callow victim, embodies the suave naturalism and suggestive genre subjects of the young virtuoso’s early works. The more rapidly handled but no less acutely observed Fra Antonio Martelli, Knight Grand Cross of the Order of Malta, c. 1608, Pitti Palace, Florence, painted while the artist was in exile, after killing a man in Rome, gave us late Caravaggio in a searching mood, revealing every detail of Martelli’s weathered face with a flood of warm light, against an indeterminate dark ground. The other two paintings, a portrait of the future Pope Urban VIII, Maffeo Barberini, early in his career, c. 1596, Private Collection, and a Saint Francis in Meditation, c. 1595, Museo Civico, Carpineto Romano, have recently been proposed as authentic works, but scholars are still wrangling. The problem with the former is that while parts, especially the sitter’s left hand gripping the chair, are accomplished and convincing, the face, with its mismatched eyes, is mask-like and there’s a rigidity and flatness to the figure wholly unlike—for example—the fully realized forms of the Fortune Teller and her mark, painted about the same time. Add the paucity of portraits by Caravaggio for comparison and debate flourishes. Saint Francis seems more plausible, despite its poor condition, but there’s another version in a church in Rome that has generally been accepted as an autograph picture since about 1908. Both the subject and Caravaggio’s radical new approach were so popular that copies were made of this work, even in the artist’s short lifetime, so arguments rage about which is the “real” version. Whatever conclusions viewers reached, the show provided a wonderful opportunity to look hard at a group of seldom seen works by (or not by) one of the most powerful and compelling artists of all time—a stubborn original whose cinematic, “spot lit” realism not only revolutionized painting during his lifetime, but also persisted as an influence, internationally, long after his early death. As to whether the Barberini portrait or the Carpineto Romano Saint Francis will be accepted as Caravaggios, we’ll have to wait for the experts to make up their minds. Since these decisions rest on the interpretation of visual evidence rather than documentation, that may take a long time. “Degas/Cassatt,” at the National Gallery, Washington, DC, similarly depended on visual evidence, albeit of a less controversial kind, rather than documentation, to illuminate the four-decade-long friendship between the two artists. The show revealed many nuances of their well-known relationship, mainly through the testimony of works of art; their correspondence has been lost, so scholars rely on indirect references and the artists’ comments to others. What is documented is that Edgar Degas saw a painting by Mary Cassatt at the Salon of 1874 and said he sensed an affinity with its author, whom he had not yet met. After that, the well-born American expatriate and the French aristocrat seem to have established a studio relationship. Since Cassatt (1844–1926) was not only ten years younger than Degas (1834–1917), but also female and less celebrated than her friend, she is sometimes described as his student, yet the exhibition made clear that she was a well-trained, formed painter when they met and that his role was one of mentor, not of teacher. The exhibition tracked the similarities in the two painters’ choice of subject matter and general approach and emphasized their common experimental attitudes toward materials and methods, especially in printmaking. (One section also made clear where they diverged, especially in their later work.) The most vivid evocation of their connection came from a group of Degas’s images of his friend and those inspired by her presence. There were two straightforward “close-up” portraits of Cassatt by Degas, but his most arresting references to her were the various versions of Mary Cassatt at the Louvre, 1879/1880, economical full-length back views that show her, from a distance, leaning on an umbrella as she contemplates the exhibits. Degas, as he often did, repeated this eloquent figure in many prints and pastels, combining the alert silhouette of his painter friend with other women, shifting the space between them, and varying the backgrounds. Yet the tall, slim woman in the stylish tailleur remains unmistakable, an emblem of focused attention. We’d know her anywhere. Equally enlightening was the analysis of one of the National Gallery’s own Cassatts, Little Girl in a Blue Armchair, 1878, the only known collaboration between the two painters. Cassatt wrote that Degas helped her with the background, but until detailed technical studies were undertaken for this exhibition, his exact role was not understood. Now it’s evident that he radically altered Cassatt’s rather flat, original arrangement in which a sofa, parallel to the surface of the canvas, and a sleeping dog filled the zone behind the child sprawled in the eponymous chair in the foreground. Degas shifted the point of view to a steep diagonal, carving out deeper space and forcing the various pieces of furniture, all upholstered in blue floral fabric, to describe an expressive, irregular shape near the center of the picture, as animate as the little girl herself, in her white dress and tartan sash. (The dog was moved to a nearby chair.) Degas’s intervention produced one of Cassatt’s best paintings, with its unexpected silhouettes, its loosely suggested fabric patterns, its orchestration of greenish blues, and its equivocal child. Nothing else by her in the show came close to the spatial authority of Little Girl in a Blue Armchair. By contrast, Cassatt’s characteristic mothers and children, young women at the theater, and family portraits seemed frontal and compositionally rather predictable. Only her fresh, scribbly dry point series, titled The Visitor, 1881, variations on a woman reaching for a chair, with another woman seated nearby, suggested something more provocative, perhaps because Cassatt was here also indebted to her mentor’s inventiveness. The Visitor reprises but reverses the general postures of the figures in the various versions of Mary Cassatt at the Louvre. But since the standing woman faces forward, instead of turning her back to peer into the fictive room, as she does in Degas’s images, surface expanse is emphasized rather than space. Throughout, comparisons such as this reaffirmed Degas’s position as the more potent artist of the two, but the tantalizing hint of studio conversations that emerged from the well-chosen works (and the interesting accompanying catalogue) forced us to consider Cassatt with renewed respect and interest. 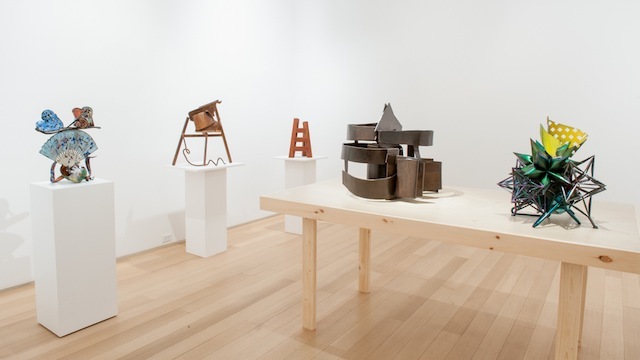 In New York, the happy overlapping of two exhibitions combined to offer a broad, varied survey of modernist sculpture. “Bronze in the XXth Century: Casting Modernity,” at Mnuchin Gallery, presented a kind of alternative history, reminding us that while Picasso and González’s exploration of open construction in iron and steel, in the late 1920s, gave sculptors a new formal vocabulary, innovative artists from the 1880s on—including some who later embraced the constructed method—continued to be fascinated by the age-old tradition of casting in bronze. For some, the technique was simply a way of making surfaces modeled in responsive materials hard and permanent, while for others, it unified and homogenized disparate components. Some celebrated bronze for its own characteristics and others exploited patination to suggest other materials, in a perhaps ironic, certainly non-traditional fashion. At Mnuchin, an impressive group of works traced the permutations of bronze from Auguste Rodin, Henri Matisse, Pablo Picasso, Henri Laurens, Constantin Brancusi, and Alberto Giacometti to Isamu Noguchi, Willem de Kooning, Louise Bourgeois, Roy Lichtenstein, Jasper Johns, Cy Twombly, Bruce Nauman, and Jeff Koons, by way of Joan Miró, Henry Moore, Alexander Calder, Lynn Chadwick, Marino Marini, David Smith, and the too-rarely-seen Germaine Richier. Aspects of the figure dominated. We could compare Rodin’s vigorously modeled interpretations of anatomy with Matisse’s expressively reinvented profiles, Picasso’s fractured forms, Giacometti’s attenuations, and Brancusi’s evocative simplifications. Smith’s abstract assemblages, as always, retained the presence of the figure, while Nauman’s ring of hands played with the tension between lifelikeness and aggressive fragmentation. The stellar group of Matisses, including all five heads of Jeannette, and the rigorous Smiths were among the standout inclusions, but there were also witty comparisons, such as the confrontation between one of Bourgeois’s apparently ubiquitous spiders and Richier’s anthropomorphic praying mantis, and suggestions of unexpected affinities, such as the unlooked-for relationship between a Calder figure assembled from tapering, interlocking forms and the Laurens. It was impossible not to think about other artists who might have been included in this thought-provoking show, but any museum would be delighted to claim the works in “Casting Modernity” as the core of a modern sculpture collection. A few blocks away, at FreedmanArt, “Carved, Cast, Crushed, Constructed” included an equally impressive group of intimately scaled sculptures by artists ranging from Joseph Cornell and David Smith to Lee Bontecou and Frank Stella, plus one “abstract” antique artifact, all assembled, like much of the Mnuchin exhibition, from private collections. Because of this, we were treated to rarely seen works, such as David Smith’s Sewing Machine, 1943, one of his few pieces in stone, made during World War II, when steel went to the war effort, not to sculptors. Sewing Machine miraculously conflates the domestic appliance and the woman using it into a slightly threatening, vaguely pre-Columbian open form. Another Smith, Spectre, 1953, a primitive, bird-like, running creature conjured up with bars of steel, was paired with Richard Stankiewicz’s Untitled (bird), c. 1960, a self-important fowl cobbled together from odd bits of hardware. Other constructed and cast works enriched the mix, including a spiky polychrome Stella, a chunky “ladder” by Willard Boepple, an engaging structure by Rebecca Smith, like a beefed-up, freestanding painting, and a playful Nancy Graves bronze, richly colored with baked-on enamels and evocative of a slightly sinister tropical plant, among other examples. If you’re wondering about “crushed” in the show’s title, there was a tiny John Chamberlain, a miniature of his compressed car part sculptures, looking as if it had been crumpled in someone’s hand. Nancy Graves, “Tanz (glass series),” 1984; Anthony Caro, “Writing Piece ‘Say’,” 1979; Willard Boepple, “For Rhum #2,” 1990-2012; Jules Olitski, “Metal Plopper, 1987-91;” Frank Stella, “k.161b,” 2011. Image courtesy FreedmanArt, photo credit Jayne Parker, 2014. Across the Atlantic, at the Grand Palais, Ilya and Emilia Kabakov’s “The Strange City,” the featured work in Monumenta 2014, occupied the opposite end of the aesthetic spectrum from the unpretentious, modest works at FreedmanArt. A series of white, irregularly shaped rooms, arranged within the great iron and glass building constructed for the Exposition Universelle of 1900, housed models and drawings of imaginary utopias—a tower built to meet an angel, receptors for cosmic transmissions, mystical volcanoes. The central room evoked a museum emptied of exhibits while another, supposedly echoing the proportions of a Renaissance chapel, was plastered with enormous repetitious paintings incorporating photo-based images evocative of Soviet-era amusements, placed at uncomfortable angles. Outside the entrance “gates,” a vast interpretation of the dome of the Grand Palais, brought down to the ground and tipped on its side, changed colors and played New Age-y music. I’ve often been interested in the Kabakovs’ installations, but “The Strange City” failed to engage me. It all seemed familiar and slick. (It was hard, too, not to think about the vast expense involved in producing the mega-installation.) Halfway through, it occurred to me that the Kabakovs’ efforts that I’d previously responded to were assemblies of found, highly charged material, recombined to create resonant, albeit fictive environments—for example, the haunting purported residue of an abandoned Soviet-era elementary school, complete with battered examples of the students’ work, official pictures, and tattered textbooks, installed in an unrestored former army barracks in Donald Judd’s Chinati Foundation, in Marfa, Texas. By contrast, “The Strange City” seemed anonymous, pretentious, and overwrought. The paintings were particularly discouraging, since they were scale-less and utterly mechanical; clearly we were meant to recognize them as indicators of ideas rather than consider them as objects with intrinsic expressive properties. The best thing about visiting Monumenta 2014 was not “The Strange City,” but the opportunity to see the superb vaulted, domed shed of the Grand Palais and its elaborate art nouveau stairs and balcony, virtually unimpeded. Happily, the Kabakovs’ elaborate installation, for all its bombast, occupied a relatively small part of the enormous floor area. Elsewhere in France, until early November, more of Barré’s subtle, evocative constructions can be seen at the Centre d’Arts et de Nature, Chaumont-sur-Loire, on the grounds and in the outbuildings of the chateau. In the elegant nineteenth-century brick stables, a hanging “crown” of bronze branches, the literalness of the image cancelled by nodes bearing the memory of the artist’s hand, squeezing and shaping the form, hovers above a disc of charcoal on the floor, the two very different assertions of roundness sensitively adjusted to the handsome proportions of the bay they occupy. Not far away, on a wide expanse of grass, high above the Loire, Barré “scattered” a group of large, open, tapering forms in cast iron. Framed by embracing trees on either side, these enigmatic, rust colored conical masses become metaphorical figures, their blunt geometry and slow rhythms contrasting with the framing trees. Among the other notable works commissioned for the 2014 exhibition at Chaumont-sur-Loire is the Brazilian sculptor Henrique Olivera’s enormous, swollen “serpent” built of layers of recycled wood and plywood. The massive structure threads through the beams and staircase of a former barn, threatening to expand beyond its confines and shatter the building in the process. Another snake-like construction, less massive than Olivera’s but with greater extension, was constructed out of recycled roots by the Russian painter turned sculptor, Nikolay Polissky. Intended eventually to decay or to be cannibalized by anyone needing wood, the piece humps along the ground, rearing up on occasion, in a barrier-like loop near a grove of ancient cedars. In addition, there are exhibitions by various international photographers and a project by Gabriel Orozco involving wallpaper patterns extracted from the empty “Princely Apartments,” high up in the chateau. And there’s an extremely good restaurant near the old farm buildings. In Paris, Galerie Anne Barrault showed “Spargentis,” recent works by Alun Williams, British-born but based in Brooklyn and France. Williams has long painted enigmatic narratives populated by historical figures and art historical quotations, with abstract patches of paint in leading roles. The patches are inspired by stains and marks discovered by Williams, with the characters he assigns to them determined by his research into the history of their original locations. Sometimes described as a modern-day history painter, Williams is more accurately personified as a lover of the entire history of art, past to present, East and West, who expresses his enthusiasm and knowledge fully in his work. “Spargentis” deals, loosely, with religious motifs, drawing upon a panoply of images of angels, bodhisattvas, saints, and martyrs, in allusive settings, with the roles of the Virgin and God the Father enacted by solidly rendered, highly specific stains. Part of the pleasure is identifying Williams’ witty allusions, but because of the heavy freight of meaning he takes onboard in his recent works, he also makes us question our assumptions about symbolism, iconography, and belief itself. And we’ll never look at accidental stains, anywhere, the same way again. Arts Review from the Summer 2014 issue.